Clean Scene Pro offers professional tile and grout cleaning for both residential and commercial clients. From small bathrooms to building lobbies, we'll make your tile floor shine. We've been in the floor cleaning business for more than 13 years. 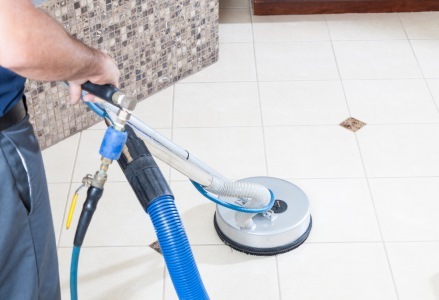 Our professionally trained staff will expertly clean any type of tile floor for a dazzling result. Call (678) 203-1929 today for a free estimate. An immaculate, highly polished floor always makes a good impression. Put your best foot forward with expert tile and grout cleaning by Clean Scene Pro. Our experienced staff has the experience and the expertise to bring out the best possible shine in any type of tile floor. Clean Scene Pro tile cleaning specialists combine high pressure hot water with powerful rotary scrubbers to deep clean your tile and grout to effectively remove dirt and mildew that surface cleaning can't reach. We have a range of tile cleaning products and tools guaranteed to make your tile and grout look great. Clean Scene Pro has been cleaning tile floors since 2006. Call (678) 203-1929 to find out how we can make your tile floor shine. Professional tile and grout cleaning. Tile is a popular flooring choice for high traffic areas, like: entryways and foyers, lobbies, hallways, kitchens, and bathrooms. But high traffic areas also require the most maintenance. The professional tile and grout cleaners at Clean Scene Pro have the tools, the technique, and the time to bring out the best possible gleam in your tile floor, no matter where it is. Our tile cleaners pay particular attention to grout and have specific cleaners for every color of grout. For professionally cleaned tile and grout floors, call (678) 203-1929. High traffic areas require routine cleaning, in addition to frequent deep cleaning for maximum durability. Clean Scene Pro offers both routine floor maintenance and full service deep cleaning for tile floors. Call (678) 203-1929 to schedule your professional tile & grout cleaning today. Ask about our commercial maintenance plans.